Kia Ora means hello in Maori. Or be well and healthy. Those were the first words we heard in New Zealand. Said by these happy, familiar faces as we came through customs in the Auckland airport. You can imagine our excitement when they opened a letter from church offices informing them they had been called to serve as Public Affairs missionaries over the Pacific Area, with a home base in Auckland, New Zealand. This is the view of Auckland from their apartment. They live in Takapuna, a suburb on the north shore. More pics of Auckland proper in another post. Now, I like maps. I like to know where I am, which body of water I’m looking at, and where we’re headed. So here’s a map of NZ for reference purposes. Maybe it will help as I take you along on our exploration of both the North and South Island. Jim and Renae kept us moving the first day so we wouldn’t sleep. And over the next week, they showed us some of the most beautiful parts of New Zealand’s North Island. I’ll slice our trip into bite-size posts (well, maybe meal-size posts) because I want to share New Zealand with you in digestible portions. I want you to experience this incredible part of the world that’s… kind of hard to get to. New Zealand is bordered by gorgeous beaches. 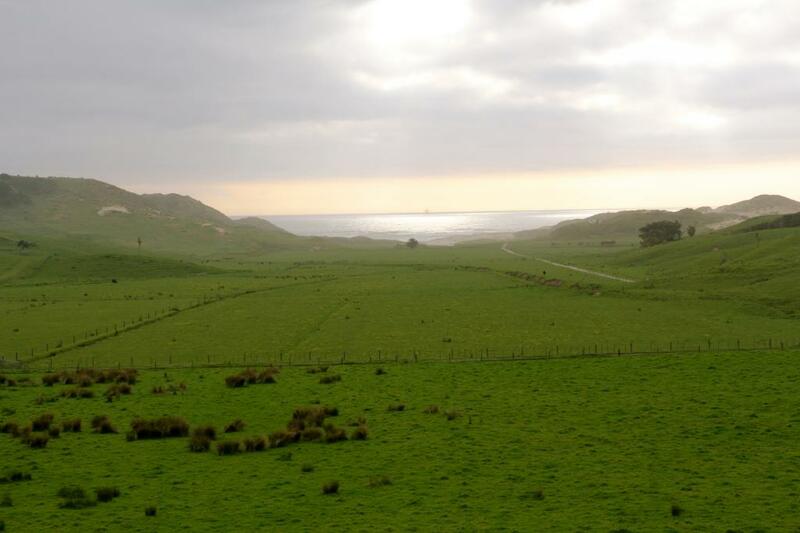 All different, with different flora, cliffs, city, or pastures bumping up against the sea. Here, we are looking out on the Tasman Sea. It was Spring in New Zealand when we visited (November). So all kinds of plants and flowers were coming into bloom. This is Flax. The plant from which flax seed hails. You know, the stuff you mix into your jamba juice. It’s a beautiful plant. And look how tall it grows! We stopped at Murawai because this time of year it is known for its gannet colonies. Gannet birds stop here to nest – on these particular cliffs – for the special wind patterns that aid in landing and take off. Look how proportional they are when establishing a place to nest. So spatially balanced. It was an incredible sight. Renae thought they looked like perfectly roasted marshmallows. I know this isn’t National Geographic but I had to get some shots of their mating dance. They would touch beaks (see below) then wrap their necks around each other. Amazing and graceful. And if you look closely, you can see their eyes, bright like blue marbles. Note Jim’s hat with the silver fern. A New Zealand symbol which I’ll explain in a bit. I loved walking behind Doug and his Mom. They love each other and he has the greatest respect for her. As do I. She is selfless in every circumstance, quick to volunteer when someone needs help, fun to be with, always up for a laugh, and going straight to heaven for raising six boys! We watched these fishermen for some time. Looking for the best spot to prop up their poles, putting on windbreakers, waiting. This was the first time I realized how far south we had come. I zipped up my jacket, gazed at the ocean stretching out in it’s cold aqua blue, and thought, we are on the bottom of the globe! The rocks were covered in these tiny black shells – scallops. Some smaller than a dime, others large as an egg. The closer they were to the water, the larger they grew. If you look at how they line themselves up you can see why we call certain trims or edges, scalloped. Everywhere you drive in New Zealand you are flanked by beautiful farmland. And would you believe, I never tired of it. In fact, for two whole weeks I kept making Doug pull over on the sides of the road for a new shot. A new landscape or vista, a new herd of sheep. It was calming for me just to drive through it, and I couldn’t get over the serene beauty of endless paddocks (pastures). After Murawai we stopped at Phil’s strawberry farm, where we tasted the biggest, reddest, most scrumptious strawberries I’ve ever had. And the strawberry ice cream? Unbelievable. See why I love Renae? She might roll her eyes at this picture of her berry-laden self, but she won’t care that I posted it or feel self-conscious. She’s a great sport. Next stop. Piha Beach. With Lion Rock in the background. Doug thought it looked more like Elephant Rock. And I had to agree. We hiked to the top of the Elephant. Marked by this Maori carving. Sea foam reflecting the rainbow spectrum. Then we hiked to Kitekite falls. Trekking through the bush was a new kind of hiking experience. With exposure to novel trees, bird sounds, plants, and flowers. This is tree fern. A tree with fern leaves growing out of it like a canopy. Totally fascinating were the new ferns, unfolding from the center of the tree, brown and baby-soft. They don’t green-up until they unfurl completely and soak up the sunlight. This symbol is called the Koru and represents eternal life, or the path of life. My favorite emblem from the trip. And this is the silver fern. Green on top, silver underneath. So silver its leaves can reflect moonlight at night and were used as trail markings for Maori trackers. It is a powerful and emotional symbol of inspiration for New Zealanders during times of difficulty or decision. And this bright pink flower is called Bottle Brush. Have you washed enough baby bottles in the sink to see a resemblance? The next day we set out to find the Kauri trees. Enormous, ancient trees – one of which dates back to the time of Christ. This is the McKinney Kauri tree. It is 800 years old and measures 7.62 meters in girth. About 21 feet. Nearby was the Warkworth museum, entrance arced with this gorgeous rose arbor. The red roses looked like they’d just been painted by the Queen of Hearts from Alice in Wonderland. Kauri trees are conical and grow remarkably straight, losing all branches on the lower levels as they rise higher and higher. Their bark is quite smooth and inside, the wood is a gorgeous light brown with no ring patterns. It makes for beautiful bowls. These are the Four Sisters. Four Kauri trees growing together. While trekking to the Sisters, I caught this picture of Renae. For some reason the light was hitting her just so and she was glowing. Can you see her halo? We saw the second largest Kauri tree but it was so dark none of my pictures were worth including. Finally, we visited the Lord of the Forest. Tane Mahuta. The largest Kauri tree in NZ. Tane is the life giver. It is believed he sprang from seed over 2000 yrs ago during the time of Christ. He is 51.5 meters tall (around 155 feet) with a trunk girth of 13.8 meters (41 feet). Walking among the Kauri trees was a spiritual experience for both me and Doug. We felt such a reverence for these large, living things. Talk about sublime. About feeling small next to something so big and looming. And yet, there was also a peaceful feeling of belonging in the forest. One that stirred respect. And we loved thinking that Tane Mahuta had been there since Christ’s time. Looking up to the top of Tane. Driving on the left side of the road was a new experience. Doug caught on quickly and did the bulk of the driving. (And there was a LOT of driving.) With very few motorways, even in the big cities, most travel is on small two-lane highways that wend and wind through the countryside. This scene nearly stopped my heart. I’ve never seen farmland like this. Stretching all the way to the sea. We noticed all the hillsides had this terraced look, which we learned is created by sheep as they travel perpendicular to the slope of the hill, walking over and over the same tiny trails. While driving back to Takapuna, we stopped at this beautiful valley as the sun was setting over the Tasman Sea. Already, NZ had won me over. Such stunning landscape and quiet beauty. Mostly untouched, with an ironic feeling of ancient newness rising out of it. Still to come… the Bay of Islands, Hobbiton, and our trip to the South Island. Have a great weekend. And if you live local, you should know Global Mom, Melissa Dalton-Bradford, is in the country and will be speaking at King’s English bookstore Monday evening (February 10th) @ 7PM. Drop in. She’d love to meet you. Did you go a second time? Thank you for sharing your trip. Wonderful photos and descriptions. Beautiful pictures…looks like an incredible trip! I am impressed you knew the names of all the plants and flowers. Love the trivia thrown in with the stunning photos!